Back in about 1952 Dad bought and sent a beautiful set of English China dishes to Mother. We lived in Elk Run Heights, a sub burg of Waterloo, Iowa. Dad, as an evangelist, was traveling, as usual. He was in eastern Canada and had been looking for just the right set of dishes to buy and send to her. He finally found it! I’ll never forget the day several large boxes arrived in the mail. We were both so excited! It was like Christmas day to us! Mother and I carefully unpacked the boxes. Only one cup was cracked and later it was replaced. Mother was a beautiful hostess. Between graduating from high school and marrying my dad she had worked for a very prominent family in LaCrosse, Wisconsin. There she learned how to be a proper hostess. She said at the time she never dreamed that knowledge would be so important to her later on in life! Being the wife of a pastor, an evangelist, an executive, a conference superintendent, and more, she had entertained many important and influential men and women. Bishops, missionaries, pastors, evangelists, college presidents, professors, the list goes on and on! 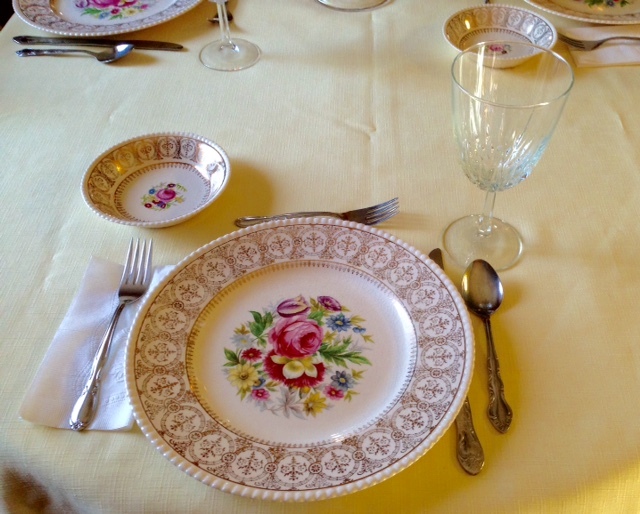 Her beautiful set of English China was well used! 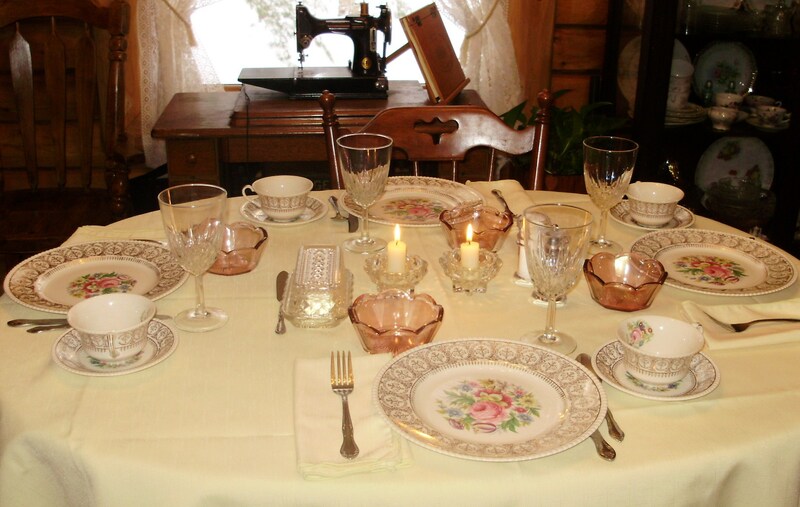 Table set with Mother’s English China. We were visiting Mother and Dad, at Warm Beach Retirement Center, in Washington, in about 1994. Mother surprised me when she said she’d like to give her set of English China to me and that we should take the set home with us! Oh, I didn’t know what to say! I was thrilled that she wanted me to have them, but how could I take them? Maybe she would need them again! Why not wait a few more years? But she insisted I take them when we left back to Michigan. So Mother and I carefully packed the dishes into a couple of sturdy boxes. So I had the joy of telling them about Mother’s English China and my joy to be serving dinner with them. I told them of all the important people who had eaten from them and now they were among the important folks also! It was a wonderful evening! This entry was posted in Canada, Dad, English China, Family, Friends, Me, Memories, Michigan, Mother, Pastor Gene and Lois, Reminiscing, Washington and tagged Dad, English China, Family, Jerrry, Me, Memories, Michigan, Mother, Pastor Gene and Lois, Travel, Washington. Bookmark the permalink. You know I love beautiful china and table-scapes to match. You have both here. There is nothing like gathering together this way – Happy Thanksgiving!